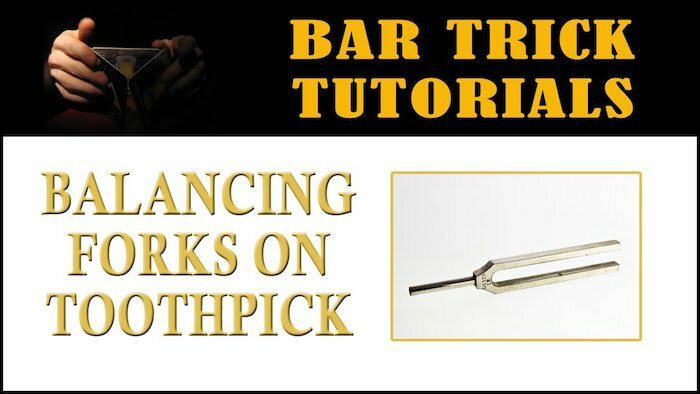 The balance forks on toothpick bar trick is seriously one of the best bar tricks out there. Not only can anyone learn it but it’s actually pretty easy to learn and perform once you know how. THE BET: What you are going to attempt to do is to balance either two forks or a fork and spoon on a toothpick which is itself balanced on the rim of a glass. And if you want to take it a step further – like we do in the video – add some fire to the mix. Light the toothpicks on fire to burn them down to the edge. 1:40 – The part about lighting the toothpick on fire is just for showmanship at the end – but it IS very effective. 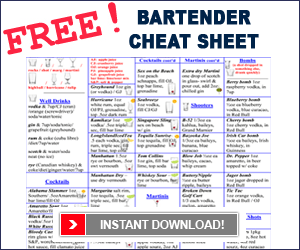 Hey, Reese Richards here, from barsandbartending.com with another bar trick to floor you. Ok, for this bar trick, all you need is a fork and a spoon, a glass, and a toothpick. Pretty much any of the pointy toothpicks, or the ones with the end and one point is ok. So, your bet is that you can balance the fork and the spoon, using the toothpick, on the edge of the glass. Ok, you can balance them on the edge of the glass. So, how do you do this? You take the spoon and you intertwine it into the tines of the fork. So, into the middle two tines. Ok, so you want to press it in here, and down a little bit, so you have the two tines here in the middle- the middle two tines- and on the outside here. Ok? And then, we’re going to take our toothpick, and we’re going to put it on the inside of the middle, right close to the spoon, ok? The middle, close to the spoon… the middle tine. And then you just have to find the right spot on the glass and you should be able to balance it on the toothpick. But! We’re not going to stop there! So, now that it’s balanced on the toothpick, we’re going to take it a step further. So, if that’s not amazing enough, we’re going to burn the edge of the toothpick on this side. So, make sure it’s steady, and then just light the end of the toothpick. Ok? Don’t worry about the flame, it will burn all the way down, and it should stop when it gets to the glass. Oh, not quite… we can go further than that. Ok, I want to burn the entire edge of that toothpick off. We’re close. We’re almost at the edge. I’d say that’s right about the edge, so that toothpick- right now- is balanced… looks like it’s defying gravity… it’s balanced right on the edge of that glass, and there’s no toothpick left on the other side. Ok? So, there’s the bar trick. That’s our bar trick for today: balancing the spoon and the fork on a toothpick… on half a toothpick! My name’s Reese Richards, thanks a lot!